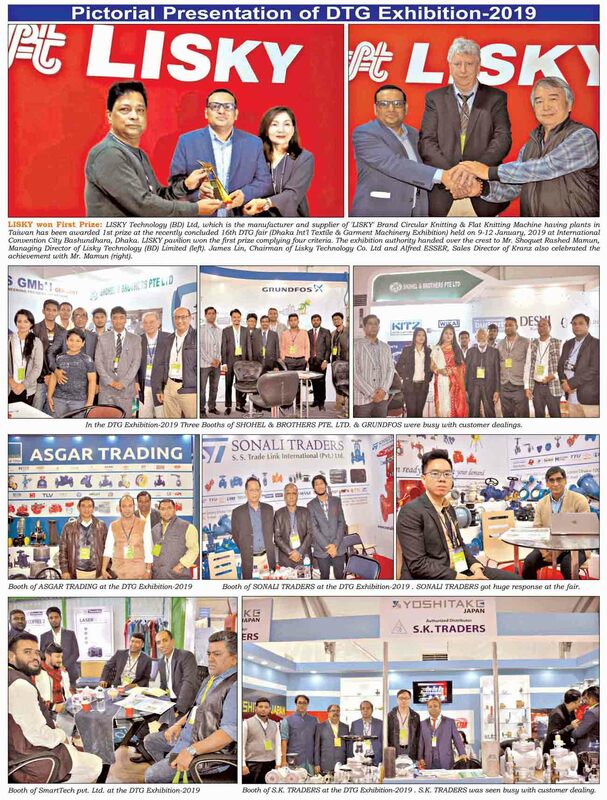 LISKY won First Prize: LISKY Technology (BD) Ltd, which is the manufacturer and supplier of 'LISKY' Brand Circular Knitting & Flat Knitting Machine having plants in Taiwan has been awarded 1st prize at the recently concluded 16th DTG fair (Dhaka Int'l Textile & Garment Machinery Exhibition) held on 9-12 January, 2019 at International Convention City Bashundhara, Dhaka. LISKY pavilion won the first prize complying four criteria. The exhibition authority handed over the crest to Mr. Shoquet Rashed Mamun, Managing Director of Lisky Technology (BD) Limited (left). James Lin, Chairman of Lisky Technology Co. Ltd and Alfred ESSER, Sales Director of Kranz also celebrated the achievement with Mr. Mamun (right).